In December of 2000, Nick Brandt was in East Africa directing a music video for Michael Jackson. When the shooting for the video was complete, Brandt took some time off and visited some of the wildlife preserves. He took along a medium format camera and began to photograph the animals he saw from the car. Now, six years later, Brandt is out of the music video business. He devotes himself full time to photographing the animals of Africa. Brandt’s approach to his work is unique…perhaps because he was never trained as a still photographer. Although he take photographs of wildlife, he is not really a wildlife photographer. He’s not interested in documenting the actual lives of real animals in the wild. Instead he creates romanticized images of animals in an equally romanticized setting. His work tends to be either cinematic in composition or almost intimate portraits of iconic animals…or a combination of both. Brandt’s animals are idealized and unabashedly dramatic. They’re almost mythical in their perfection. Brandt creates these archetypal images deliberately; it is the heart of his art. Brandt prefers to work close to the animals, usually in a vehicle. The vehicle is important not just for safety reasons, but because the animals are accustomed to vehicles; they’d run away from a human on foot. He uses a Pentax 6X7 camera and only a few fast prime lenses (75mm, 105mm, 150mm and occasionally a 200mm). Those lenses allow him to get the narrow depth of field he finds so attractive. He shoots in black and white…unusual for wildlife. He frequently uses a heavy neutral density filter and often a red filter to darken the sky. 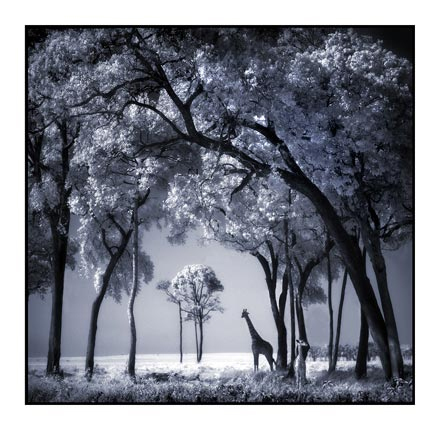 Brandt claims he does very little photoshop manipulation of the image other than his signature vignetting and occasional adjustments to contrast and tint. Most of the unusual effects he obtains are, he says, created by trying odd things with the camera. 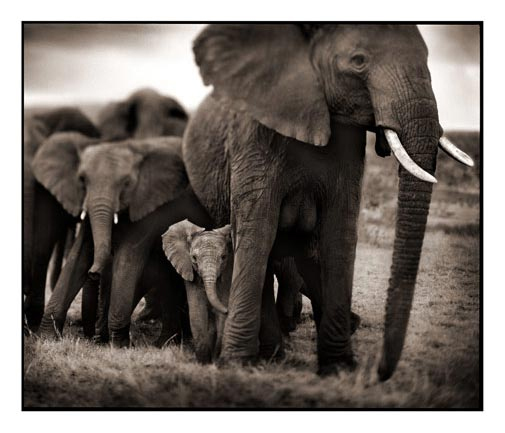 A lot of wildlife and nature photographers criticize Nick Brandt. They call his work unrealistic, they claim he manipulates his images more than he admits, they say his images are sentimental, they say there is nothing natural about his view of nature. And they’re right. Brandt’s photographs aren’t about nature at all. They’re not about real life. They are about depicting these animals as they exist in the minds of people throughout the world. 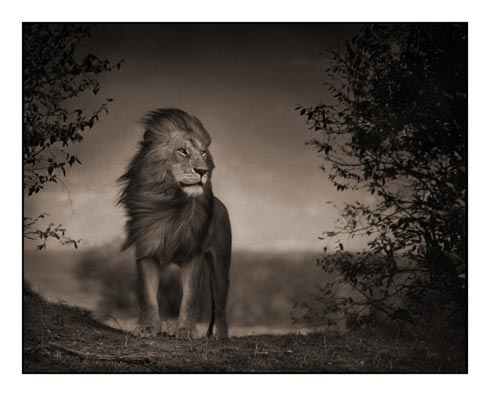 Nick Brandt isn’t so much photographing animals as they exist; he’s photographing animals as we wish they existed. That’s his art.